Veronika Verterich was born in Moscow, Russia in 1994. She moved to the U.S. at the age of three with her parents who are both professional dancers. Veronika completed her ballet training over nine years at Valentina Kozlova’s Dance Conservatory of New York. She joined the Dutch National ballet’s Junior Company in August 2013. Veronika has participated and placed in national and international ballet competitions including the “Varna International Ballet Competition,”in Bulgaria “World Ballet Competition” in Orlando, “The Youth America Grand Prix,” and “The New Jersey Dance Festival.” In 2010, she became a laureate of the “The Young Ballet of the World Competition” in Sochi, Russia. 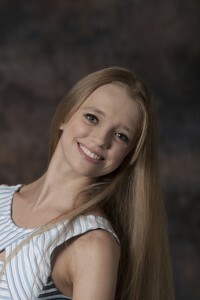 Veronika was invited to perform in numerous galas, such as the “Boston International Ballet Competition Gala,” and “Evening with the Stars,” in Indianapolis. She also performs as a guest artist with North Carolina Dance Arts Theatre and Delaware First State Ballet Theatre. This is her fourth time performing on the Evening with the Stars after previous appearances in 2010 in Margo Sappington’s Night and Day with Vitali Krauchenka, in 2011 in Grand Pas Classique with Alexandre Hammoudi on the Young Stars of Ballet and in Sappington’s Black or White with Alex Anderson, and in 2012 in Sappington’s ensemble work called This Thing Called Love and Demis Volpi’s Little Monsters with Alexandre Hammoudi.